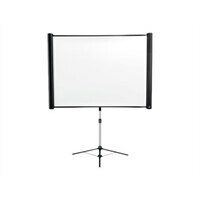 An easy-to-use, portable projection screen, the ES3000 is ideal for the mobile presenter. This innovative projection screen from Epson provides the perfect solution for both brilliant business presentations and amazing home theater applications. Take it anywhere. With the included wheeled case, it's easy to transport. And, setup is simple. With its unique, one-piece design, there's no need to assemble various components. In no time at all, you'll be ready to sit back and enjoy brilliant images on a bright white screen.